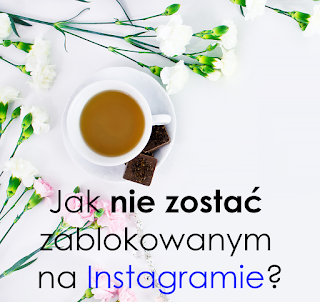 Caroline Koziol – a Polish woman who has been living and working in Great Britain for the last 5 years. She is a journalist and reporter in local television. She loves challenges and difficult topics. 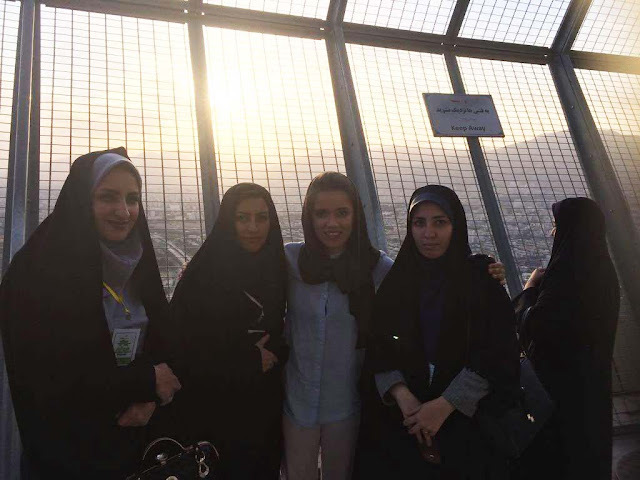 Lately, she had the opportunity to visit Iran, at the same time learning about the situation of women in a country ruled by religious dogmas. She talks to me on website Kulturalne Rozmowy about her latest book, hijab and heroic fight for liberation started by the young generation of activists. Who is Caroline Koziol? After visiting your site, I found out you work in the UK, where you currently reside and that you finished university there, but how did that all come to be? Caroline Koziol: I’m someone in pursuit of dreams and freedom, addicted to adrenaline and journey into the unknown. I work and live in London for a year and a half now, I came here to do my Masters, before I lived in Wales and the US. Is travelling a way of life for you? How did you get into this way of living in the multicultural society we’re in? Once someone told me you shouldn’t describe how educated you are, but rather, how travelled you are. Travelling shapes us, it opens our eyes, lets us discover our greatest strengths and weaknesses. Travelling does not only let you discover new places, it’s also a fantastic way to discover yourself. Is it my way of life? I don’t think so. I live in London, where I work in TV, but I also make many documentaries abroad. Right now, I’m getting ready to shoot a documentary in Somalia. At such a tender age (23), why have you become so focused on such complex issues, devoting yourself fully to them, by for instance travelling to such a dangerous country? You know, in my experience the things that appear most dangerous, usually aren’t dangerous at all. I lived through the favelas, northern Africa, the Middle East and I realised that there are no dangerous places, only dangerous people. They live everywhere around the world, even in London, where there have been many acid and terrorist attacks. I strongly believe in people and all the people I’ve met in my life have turned out to have huge hearts and an even bigger faith in the world than myself. You just have to look out for yourself. The issues I tackle are difficult, that’s true, but that’s exactly why they’re worth fighting for. Do you make a list of things to do before setting out on each journey? Or do you rather do it all spontaneously and wait for the one moment that is worth capturing on camera? The only list I make is the list of camera shots. Travelling for me is all about forgetting and tranquillity. I close one chapter and open a new one and feel like a new-born child. I don’t think about the past, because I can’t change it, I draw conclusions from it and try not to make the same mistakes again. I focus my mind on the beautiful gift that is travelling. When I travel, I feel alive. What was your first impression after you stepped on Iran soil? What did you expect from it? You must have had some apprehension after hearing the myths? Are you able to dispel any of them? Hmm, I must admit I was scared of the strict border controls and that they would detain me and my crew at the airport, preventing us from carrying out our work. Many people have told me about the number of reporters imprisoned in Iran. I feared I would lose my freedom and go to prison. However, my dreams were stronger than fear. Iran is a very hospitable country, I met many wonderful people, with whom I still keep in touch to this day. The first association I have with Iran are its wonderful people. How did you feel in a culture so restrictive towards women? I mean you – Caroline – are a European woman, one who doesn’t live in Poland, I might add. Did your emotions not run high? As someone who loves their personal freedom, the fact that I had to go jogging with a hijab or cover up on hot days was inconvenient to say the least. I remember one time a hijab had slid off my head and I was approached by a man straight away who pointed to it, telling me to readjust it. 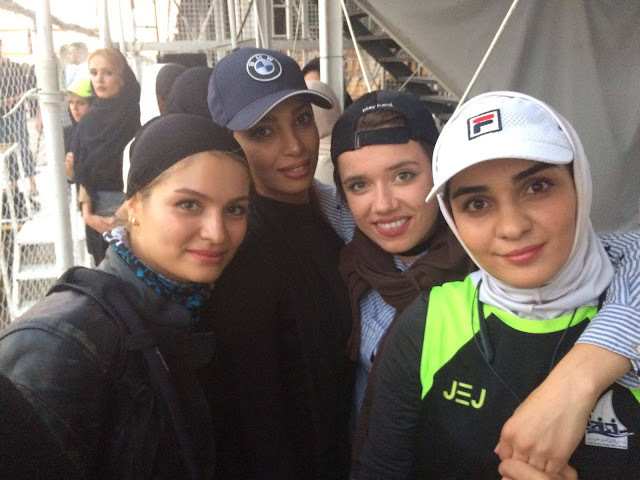 What is a hijab for Iranian women – a part of their identity or an unpleasant duty? How do they explain wearing it? Does it not bring suffering for them – if not physical, then ideological? You, as a European, don’t have to wear one, but when you entered Iran, you had to assimilate to their culture and put one on. Is it not a strange feeling? How did you feel with a hijab on your head? At one point you said you got used to it. Could you live in Iran and be a part of its society? 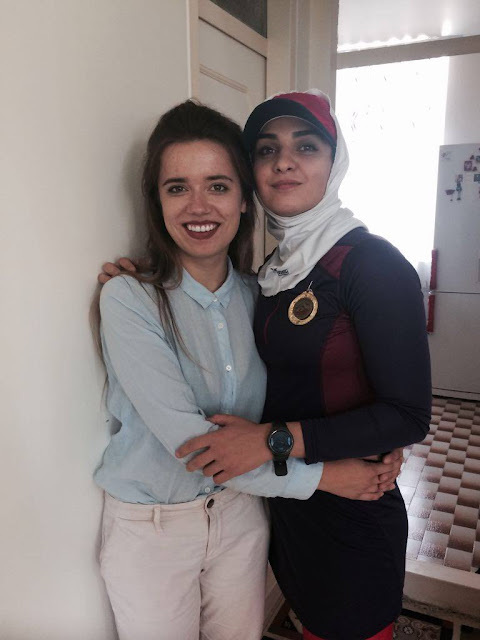 Yes, I could live in Iran, because I miss the people I met there, but I couldn’t wear a hijab. After speaking to many women there, it appears that the majority opposes wearing a hijab, however there are some who consider it a part of their culture and are against the hijab ban. Speaking about your age – what do women in their 20s – Iranian think of all this? Women who under different circumstances would be laughing, having fun, enjoying their youth, but in Iran are simply fighting for their freedom. How do older women react to it? How do they treat activists? Have you had an opportunity to investigate it? Wearing a hijab is a difficult and delicate subject. There is the White Wednesday movement, where women post pictures on social media of themselves without a hijab and advise other women to follow them. This movement, surprisingly enough, is supported by men as well. I don’t know if I was fighting for their freedom, because if you put it like that, then I failed. I was chasing freedom and I wanted to depict this problem, as well as the culture of Iran. The younger generation, both men and women, want to lift the order to wear hijab, especially in larger cities. I met a few women from small towns and villages who told me that for them hijab is a symbol of culture and religion and they want to wear it forever. What is Iran like as a country? Why do you think so many tourists, despite the media backlash, choose Iran as their destination? Iran is a wonderful country to travel to, I recommend it. The media has huge amounts of power to shape people’s outlooks, but the media unfortunately lies. I felt safe in Iran. My friend went to Yemen not too long ago. I have to admit I was scared for him and awaited his phone call anxiously. He rang me up and said calmly ‘I’m safe, life simply goes on here, people live normal lives’ – he laughed and told me that he’s more worried about me living in London, because of all the acid attacks. In your book you list a couple of virtues, which ones are the most important ones to you? In Iran, its biggest virtue were the people I met! Travelling is made by people. That’s why this journey turned out to be so wonderful. Men want change, they support the ban to make hijab wearing mandatory. The society is very well-educated and strive for gender equality. What are women to men in an Islamic community? I get the feeling that being born in a region, where your life is dominated by religion is a personal tragedy. I get the feeling that women are persecuted only for wanting to be themselves and stepping outside of societal or cultural norms turns them into scapegoats to be discriminated against, humiliated and ultimately destroyed. Hmm, you know, I actually know personally many people who have suffered from relationships where the man was a tyrant – he beat his wife, kids, drank a lot etc. I’m sure you know some cases from your personal environment too. We’re all people and mentally unstable people are everywhere. What would constitute a greater tragedy – being born in Iran and having a loving husband, and of course the obligation to wear a hijab, or being born in the UK and living with a tyrant? What about respect for physicality, femininity, humanity, progress? Apparently, the Quran even so much as promotes it, but it seems that it’s not being implemented. Is it all because of religious fanatics, or is it something else – perhaps male mentality? It’s very delicate and sensitive, but religion does not define a human being. We’re all just people and religion should unite us, not divide us. Why the opposite is the case, I don’t know. We shouldn’t put people in little boxes labelled Christian, Muslim, Jew etc. We should look at people through the prism of how good their heart is. Sometimes when I tell people that I’m going to a Muslim country, they tell me I should be weary of its people. I don’t like that. Why should I not trust these people? Why don’t some people want to make at least a little effort to discover a different culture and realise that actually we are all just ordinary people. What does freedom mean to these women? How is freedom different to the women of Islam and European women? After your travels there, how has your perception of these two different world changed? Freedom is a state of mind and everyone has a different definition of freedom, so I’m not able to answer that question. Although I must say, I’m extremely grateful of the fact that I don’t have to wear a hijab. What is the main driving force behind Iranian women growing stronger, protesting for their rights and more importantly not being met with much opposition, on the contrary, receiving increasingly more support? Where do they draw their strength and hope from? Education and the modernisation of the country are the main factors behind it. Do you have any advice to those wanting to travel to Iran? Don’t be afraid of taking this journey, a wonderful adventure awaits you. Why is it more difficult for some to obtain a visa to this country than others? t’s mainly to do with the relations Iran has with some countries (USA). Do you get feelings of sadness and regret whenever you say goodbye to a place and its people? Do you think you’ll ever want to go back to Iran? 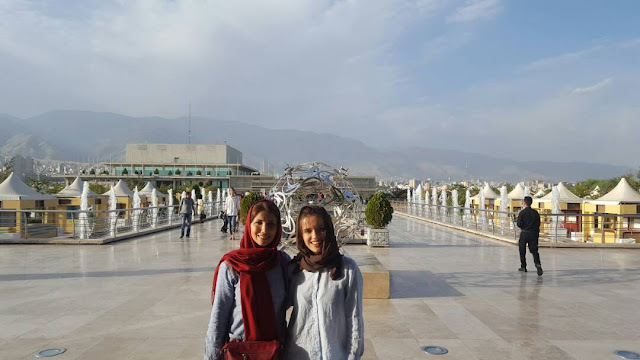 I would love to go back to Iran, but I didn’t feel any regret or sadness. It was a wonderful chapter of my life, one after which I put a full stop and moved forwards. I learned many lessons and brought back memories with me. Was there a time during filming your documentary when you wanted to simply forget about your mission, put down the camera and the microphone and simply be a tourist, listening to the locals’ tales? Yes, when I went for walks and runs. I went out partying with some of the main characters of the book a few times too.